Sometimes there's an inverse relationship between the size of things and the appeal. Such is the case with the miniature quilts at Quilt Festival in Houston, TX. They are small is size, but certainly measure up in intricate detail. Dancing Dahlia by Laura Welkin came away with the category's top prize. Her original design was made entirely by machine, using fused raw-edge appliqué with blanket stitch, and turned edge appliqué with an invisible machine stitch. Free-motion with silk thread was used for the quilting. 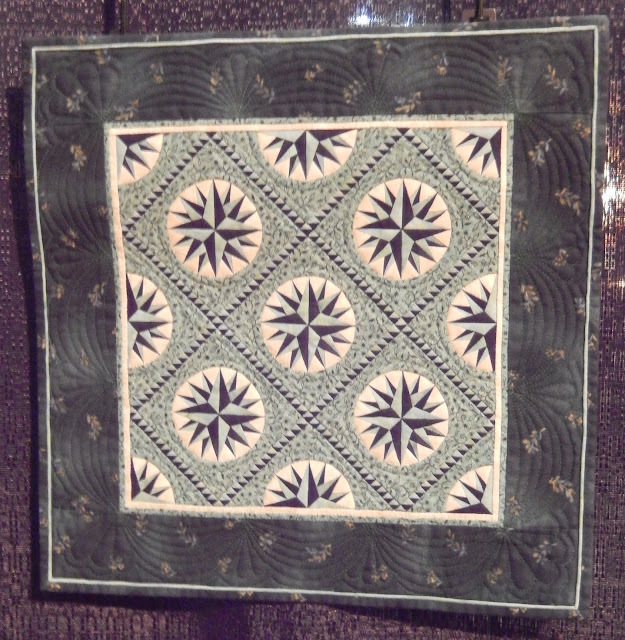 Pat Kuhns showed off her pointed precision with her Mariner's Compass mini, Sea Breeze. which won second place. She drafted her own foundation piecing pattern for the 2 1/2" blocks. 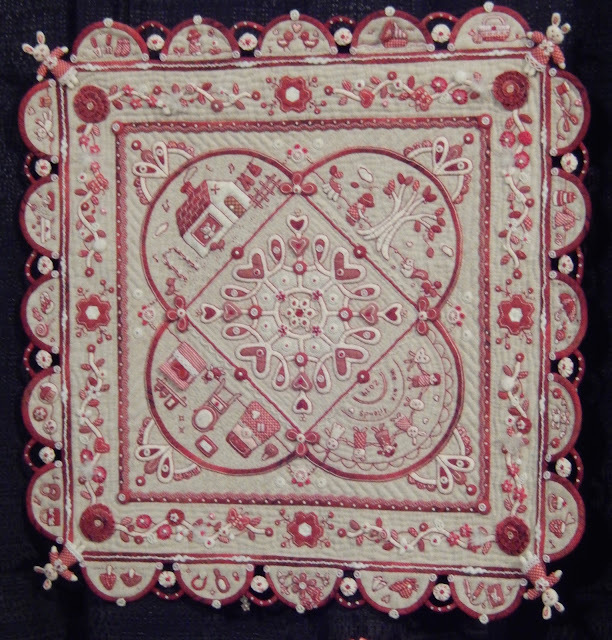 The circles were attached to the top with needle turn appliqué. 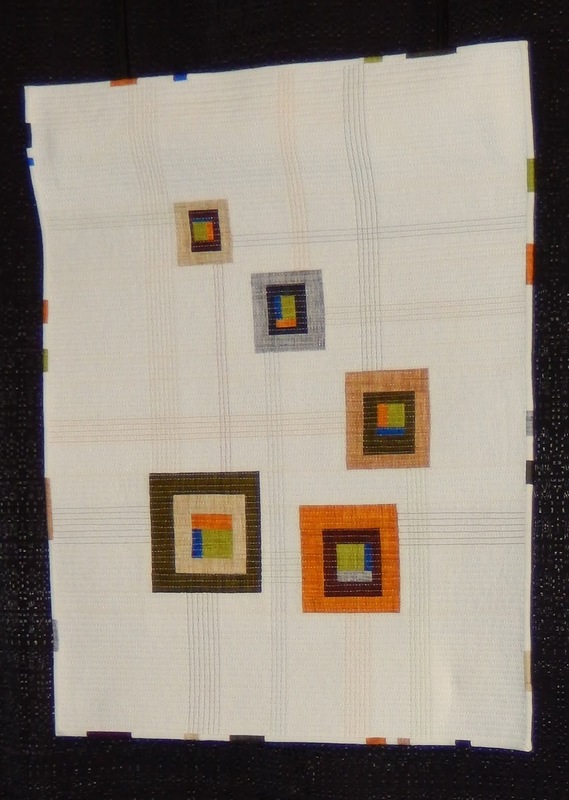 Third place went to Almost Squared Away II by Sharon Schlotzhauer, which is a shrunken rendition of Almost Squared Away. Honorable Mention was awarded to Come on to My House by Aki Sakai, who combined hand piecing, appliqué, embroidery, yo-yos, and itty bitty bunnies to successfully compress all the comforts of home into this red and gray marvel. Have your ever made a mini? Can you envision adding this amount of detail to something so small?